Randolph, Massachusetts...About 7 miles south of Boston. In the years following World War II, spirits were high, the economy was booming, and the victorious veterans of that great war married their sweethearts and set about raising families. New neighborhoods of modern ranch style houses cropped up across America to accommodate this growing baby boomer generation.Christy Lane was one of those such neighborhoods. And it was into this neighborhood, on January 11th, 1959, I entered the world. My father was a television engineer. A somewhat prestigious occupation at the time, as that popular medium was still relatively new. I was, as mom always referred to me, the "afterthought" of the family. At the time of my birth, I had three older sisters...in high school, junior high, and first grade. 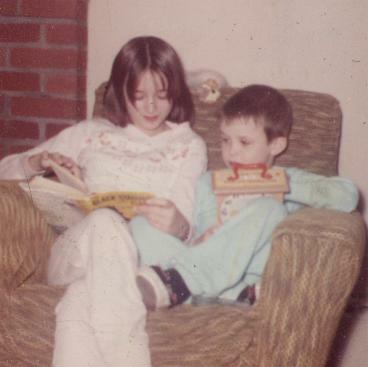 My sister Karen, at six years older was closest to me in age. 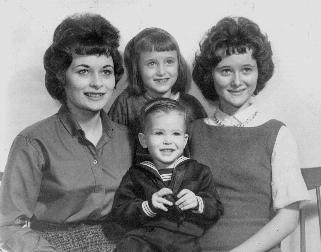 Of my two oldest sisters, Peg and Donna, Donna was as many years older than Karen. They had always doted on her until I came along...quite the novelty...a little BROTHER! So, needless to say...Karen resented the fact that I was ever born. And to me, she was just a bully and all out "big meanie". In this next photo, we were probably both wishing our guns were real. we did have our moments. By the time I was four years old my oldest sister Peg was already out of the house. She went to nursing school and she and a fellow nurse trainee took an apartment near the hospital where they trained. Peg realized early on she wanted to be a nurse. Although my mother claimed that inspiration came when she delivered some kittens for the neighbors' cat, I wonder if it really came as the result of the cool head she kept once when I was not quite two and almost died of tetany. I guess only she knows for sure. Donna was the intellectual one of the family. She was an all around honor student all through high school, and I guess she realized just as early on she wanted to be a teacher. When I was a little kid, both Peg and Donna were doting and would often ask me "Who's your favorite sister?" and I, of course, would answer accordingly for whichever one asked. But Donna's the one I was really closest with. She used to spend a lot of time with me sort of practicing teaching. The first magazine subscription I ever had in my name was "Humpty Dumpty" when I was a preschooler. It was Donna who had actually taken it out and put it in my name, and every month when the new issue came, she would read me the stories, teaching me to read and write the simpler words, we'd do scientific experiments in the mag, and even sing the songs. You see, she had been in the school band and knew how to read music. Donna ended up earning a full scholarship to Middlebury College.